As you remember your loved ones today, and tend to your emotional heart needs, don’t forget about your physical heart! We all know the stats. 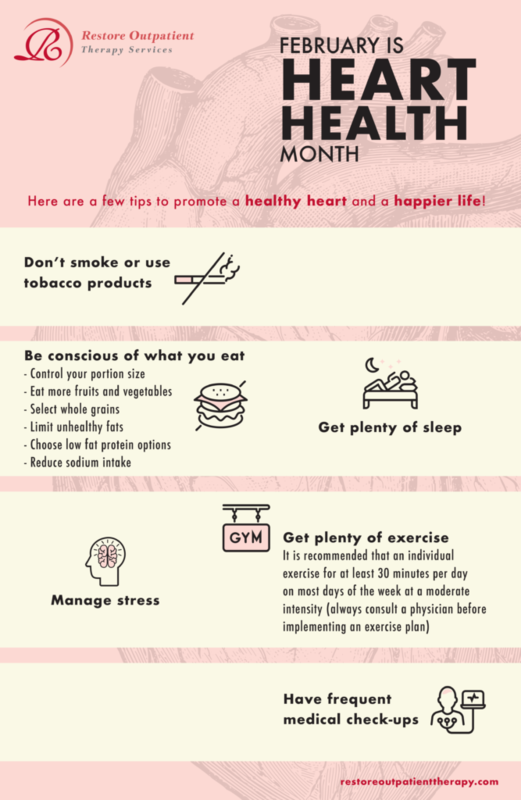 Smoking is a major cause of cardiovascular disease (CVD) and causes approximately one of every four deaths from CVD, according to the 2014 Surgeon General’s Report on smoking and health. CVD is the single largest cause of death in the United States, killing more than 800,000 people a year. More than 16 million Americans have heart disease. Almost 8 million have had a heart attack and 7 million have had a stroke1. Atherosclerosis: The build-up of fats, cholesterol, and other substances in and on the artery walls. Coronary Heart Disease: Damage or disease in the heart’s major blood vessels. Stroke: Damage to the brain from interruption of its blood supply. Peripheral Arterial Disease (PAD): A circulatory condition in which narrowed blood vessels reduce blood flow to the limbs. Abdominal Aortic Aneurysm: An enlargement of the aorta, the main blood vessel that delivers blood to the body, at the level of the abdomen. To lower your risk of coronary heart disease, stick to a healthy diet of oily fish, fruits and vegetables, legumes, nuts and seeds, fiber, and vitamin E 2. Fatty deposits, or plaques, cling to the artery walls and can clog the arteries, making it more likely that a blood clot will form. A heart attack occurs when a blood clot blocks one of the arteries of the heart. When we eat foods high in saturated and trans fats, we increase blood cholesterol and heart attack rates. Saturated and trans fats in the diet tend to increase low density lipoprotein (LDL) cholesterol in the blood. Common sources of saturated fats include animal products (butter, meat fat, beef, lamb, chicken skin and full cream dairy foods), and processed foods like pastries and fast food meats. The average adult needs 7 hours of sleep a night, though more than 1 in 3 Americans say they don’t get the recommended amount of sleep. Lack of sleep can lead to high blood pressure, type 2 diabetes, and obesity. Sleep apnea happens when your airway gets blocked repeatedly during sleep, causing you to stop breathing for short amounts of time. Sleep apnea can be caused by certain health problems, such as obesity and heart failure. Insomnia is trouble falling sleep, staying asleep, or both. As many as one in two adults experiences short-term insomnia at some point, and 1 in 10 may have long-lasting insomnia.Insomnia is linked to high blood pressure and heart disease 3. Stress. How many of us can say we’re not stressed? Career, relationships, children, finances, the stresses of adult life can pile up. Stress may affect behaviors and factors that increase heart disease risk: high blood pressure and cholesterol levels, smoking, physical inactivity and overeating. Some people may choose to drink too much alcohol or smoke cigarettes to “manage” their chronic stress, however these habits can increase blood pressure and may damage artery walls 4. Exercising, maintaining a positive attitude, not smoking, not drinking too much coffee, enjoying a healthy diet and maintaining a healthy weight are good ways to deal with stress. For tips on managing your stress, visit the American Heart Association or contact Restore Outpatient! Lastly, be sure you know the warning signs for a heart attack. Some heart attacks are sudden and intense. But most start slowly, with mild pain or discomfort. more than a few minutes, or that goes away and comes back. It can feel like uncomfortable pressure, squeezing, fullness or pain. • Discomfort in other areas of the upper body: Symptoms can include pain or discomfort in one or both arms, the back, neck, jaw or stomach. • Shortness of breath: May occur with or without chest discomfort. • Other signs: These may include breaking out in a cold sweat, nausea or lightheadedness. February is Heart Health Month and Restore Outpatient’s focus on Wellness facilitates a better quality of life for its clients.